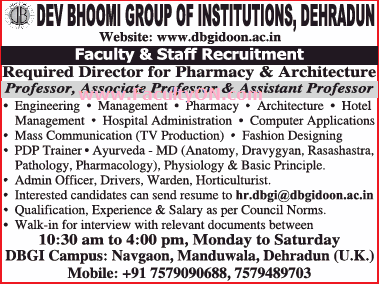 Dev Bhoomi Group of Institutions, Dehradun has advertised in THE TIMES OF INDIA newspaper for recruitment of Professor / Associate Professor / Assistant Professor / Director Plus Non-Faculty jobs vacancies. Interested and eligible job aspirants are requested to apply or walk-in immediately from Monday to Saturday as soon as possible from 25th July 2018. Check out further more details below. About College: ​DBGI,Dehradun was established in the year 2005; approved by AICTE, New Delhi and MHRD, Government of India and affiliated to Uttarakhand Technical University(UTU,Dehradun)/Pharmacy Council of India(Government of India)/Uttarakhand Board of Technical Education Roorkee(UBTER). How to Apply: Interested and eligible candidates are requested to send application along with CV, photocopies of all the testimonials and recent PP size photo to the email address or appear for Walk-in interview on any working day from Monday to Saturday at the walk-in address provided below.